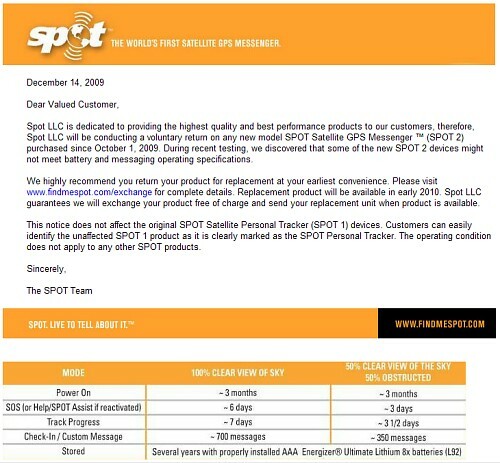 SPOT LLC has issued what they are calling a “Voluntary Return Program” for their recently released second generation SPOT Satellite GPS Messenger which even they are now referring to as “SPOT 2.” The email sent to all registered owners is reproduced below with the text of the email following. We’d call it a recall, and obviously have, “a rose by any other name” and all that, but there are no doubt legal reasons why they are choosing not to do so. Just to be clear, this recall does NOT involve the original SPOT Satellite Personal Tracker, just the second generation SPOT 2 as shown to the right in the photo. When we tried the procedures outlined on the SPOT 2 exchange web page we found some inconsistencies which we brought to the attention of SPOT and their tool for determining if your SPOT 2 is affected was not working. They assured us they would being taken care of, but apparently not until all the emails were sent out. Only some units are affected by the recall, but the recall notice was sent to all SPOT 2 owners, so even though they can clearly identify which units are affected and who owns them, it’s in their database, each customer will need to check to find out if their SPOT 2 is affected. They explain that this will allow them to deal with other owners who hear about the recall, but via other means such as this posting, and won’t know if it covers their SPOT 2. We can think of a number of ways to accomplish this that doesn’t inconvenience owners with out an affected unit, but… At least they are working to do the right thing. 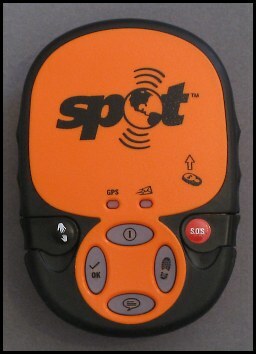 In discussing this issue with SPOT representatives, they explained that the problem which they relate in their notification as being “not meet(ing) battery and messaging operating specifications,” is that at least some of the SPOT 2 devices are indicating via the “ON” button flashing red that the batteries require replacement well before they actually do. I suppose that this is better than waiting until it is too late, but clearly it presents its own problems. SPOT says they have not been able to determine what specific units are affected, so they are exchanging all units. Retailers have been notified to return all stock of the SPOT 2. Any customer who recently purchased a SPOT 2 and hasn’t yet registered it and paid for the annual service will be blocked from doing so and will be sent to the return program page. purchased since October 1, 2009. During recent testing, we discovered that some of the new SPOT 2 devices might not meet battery and messaging operating specifications. www.findmespot.com/exchange for complete details. Replacement product will be available in early 2010. Spot LLC guarantees we will exchange your product free of charge and send your replacement unit when product is available. identify the unaffected SPOT 1 product as it is clearly marked as the SPOT Personal Tracker. The operating condition does not apply to any other SPOT products. SPOT 2 Recall Announced was written on December 14, 2009 and filed in Gear, News.